Official kit suppliers to the national teams playing in the 2018 football World Cup are not alone in hoping to boost their sales during the event (to give an example, in France, the host nation of the 2016 European Championships, football jersey sales grew 16% during the tournament compared to a non-tournament year). The World Cup, scheduled from June 14 to July 15 in Russia, is also a great marketing tool for fashion brands, and they have embraced it fully, with dozens of labels ready to play their part by launching a spate of capsule collections, some of them eagerly awaited. Nike, besides being the kit supplier to ten World Cup nations, has also spawned other football-related projects, calling on two of the most prominent contemporary designers: Kim Jones, the former creative director of Louis Vuitton Homme, now at Dior Homme, and Virgil Abloh, the founder of Off-White, who took over from Kim Jones at Louis Vuitton. 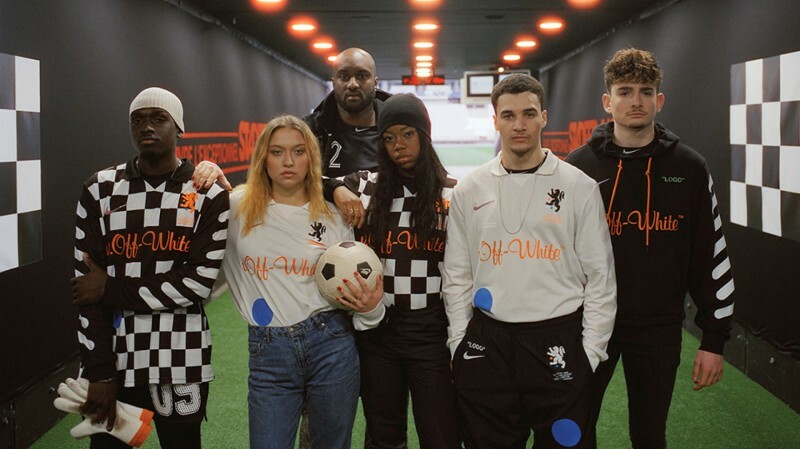 They created respectively the ‘Football Reimagined’ and ‘Football Mon Amour’ collections, available at selected retailers from June 7 and June 14 respectively, and featuring football jerseys, sweatshirts and sneakers. Adidas, kit supplier to twelve World Cup teams, has instead worked on a collaboration with Russian designer Gosha Rubchinskiy, creating three items (a jersey, a pair of football boots and a football) for each of the competition’s host cities. The German sport brand is also going for customisation, its website giving customers the opportunity to style the iconic Gazelle sneakers or the Adilette slides in the colours of their country flag of choice. Adidas will also reissue, with the Adidas Originals Retro Football collection in partnership with Asos, eight national team jerseys from the 1980s and 90s, including Belgium, the USSR, Spain and Colombia. Sport brand Umbro too went back in time for inspiration, working with British designer Christopher Raeburn on six retro, limited edition items. They will be available in mid-June, and celebrate the England football team and the World Cup years in which it excelled, de-constructing period kits to create an eco-responsible collection made of recycled material. 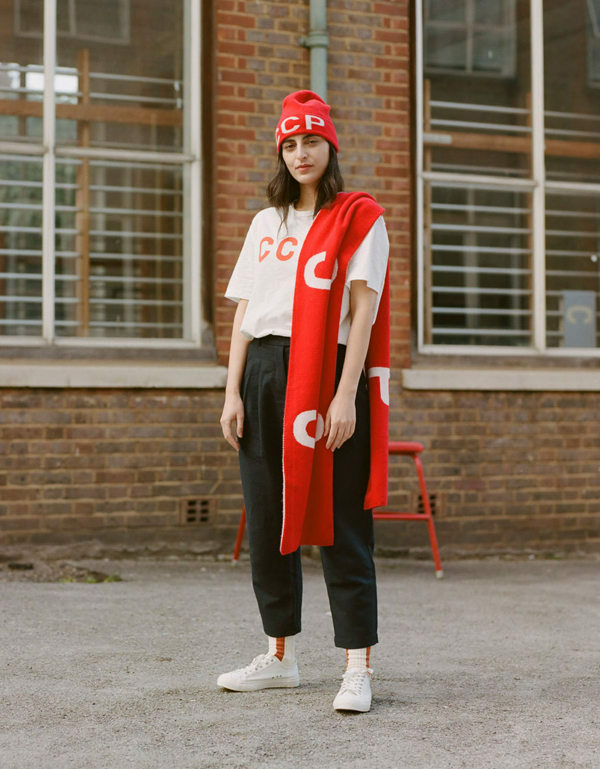 Also London-based label You Must Create has dipped into sports archives, and re-appropriated the ‘CCCP’ logo (the acronym in Cyrillic characters of ‘Union of the Soviet Socialist Republics) featured on Soviet Union football jerseys, affixing it on t-shirts, bob hats, sweatshirts and supporter scarves. Some labels, like Havaianas and Boss Kidswear, took the opportunity to launch products in national football team livery, while others decided to go for something more eye-catching. Fashion e-tailers Boohoo and Boohooman for example joined forces with Pepsi, which has already launched a football-themed ad campaign called #loveitliveit. Five international artists (DIYE, Bicicleta Sem Freio, DXTR, Kim Sielbeck and Iain Macarthur) inspired the Boohoo x Pepsi collection, a must for athleisure fans, which includes jackets, cropped tops, bum bags and printed sweatshirts. Yoox went down a similar creative route, and asked fourteen designers to style a series of men's and women’s sweatshirts and t-shirts inspired by their own countries: among them, Christelle Kocher for France, Glenn Martens for Belgium and Vivienne Westwood for England. Amazon has instead introduced an e-store dedicated to the World Cup. The Amazon Football Club allows fans to buy all the products inspired by the tournament, from the FIFA 2018 videogame to flat-screen TVs, Nike footballs and even that indispensable tool for pre-match aperitifs, the chorizo slicer.